If you care about and love the natural environment then there cannot be many better places to live in England than East Cottingwith for its wide diversity of wildlife, wildflowers, and wetlands. 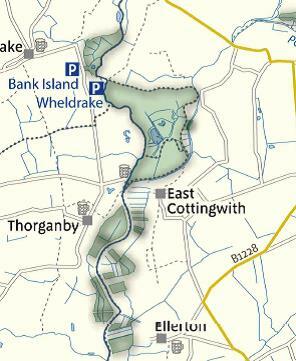 The map below, taken from the Natural England leaflet on the Lower Derwent Valley (LDV) shows where we are situated in the LDV and on the edge of the nature reserve itself, (the shaded green areas). The LDV National Nature Reserve is made up of a series of flood meadows, pastures and woodlands. The reserve supports a rich diversity of plant species and outstanding populations of breeding and wintering birds. With the River Derwent itself running past the village, and the Pocklington Canal starting at the village, the waterways themselves, as well as the flood meadows, add to the diversity and importance of the area such that the reserve has been declared a Special Protection Area and a Ramsar site. (click on the Bold text to find out more). Parts of the Lower Derwent reserve are managed by the Yorkshire Wildlife Trust and the Carstairs Countryside Trust. For more information about Lower Derwent Valley, including directions and facilities, see the information leaflet published by Natural England. You can also link to their blog and read about how bird activity in the area is being monitored by Natural England’s NNR team, volunteers and local bird ringers.